Amitabh and Jaya, Jaya and Amitabh in whichever way you say, you just cannot think of one without thinking of the other, they are inseparable, in a way they complete each other and compel you to think of their partner as well. They are the most epic couple that Bollywood Industry has ever witnessed. THE BOLLYWOOD POWER COUPLE, as you may say. Since 3rd June 1973 when this beautiful couple was tied together in the bonds of holy matrimony, to this day, after 44 years, their love is still as fresh as the first day. 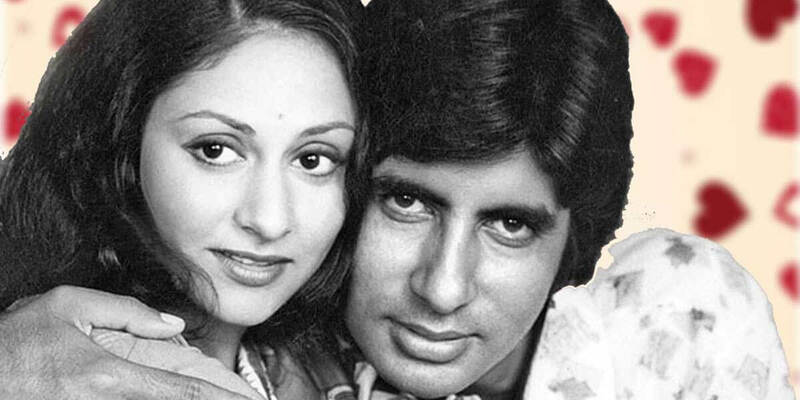 So let’s get back in time and rediscover the epic love story of AMITABH BACHAN and JAYA BHADURI. This romantic tale began with just a glimpse, not even an eye to eye contact, but just a glimpse, just like a soft and subtle breeze of that beautiful summer day which lasts for just a moment but it truly touches your mind with its refreshing beauty. This love breeze touched Jaya’s heart when she first saw Amitabh at Pune Film Institute. Although Amitabh’s charming personality ignited a spark in Jaya’s soul, nothing substantial happened. And now, just like you got over your old high school crush, Jaya too could have gotten over him. But that didn’t happen, maybe because destiny denied this. Their paths crossed again on the set of the movie GUDDI. This is where their story took a turn and Jaya fell in love with Amitabh’s amazing personality. That little spark in Jaya’s mind has grown to become her desire, that summer breeze had now taken the form of a fierce wind which continuously rang the bells of love in her heart. Although he was still struggling to make his mark in the industry, he wasn’t successful and established like Jaya, but this didn’t stop her from falling in love. Jaya overlooked all, she just looked for a beautiful heart which she found in Amitabh. Just like you have your best friend who always tries to find faults in the person you love, Jaya too had such people in life. But even that didn’t stop her from being head over heals in love with Amitabh. Love truly governs all. But on Amitabh’s part, he didn’t have a clue at all. By this time he had no feelings of affection for Jaya. But destiny was determined to make them fall in love, it tried once again, and this time it succeeded. This time it was the set of EK NAZAR, where Amitabh realised that the way he looked at Jaya had changed ‘Jaya ki tarf Amitabh Ka nazariya hi badal chuka that’. Amitabh too heard the ringing of love bells in his heart. And that’s how it happened, the epic couple was truly in love. Destiny had finally succeeded in bringing together. But just like any other love story, this love story too should have an interesting turn of events right???? This romantic tale witnessed that epic turn in the year 1973, before the release of the movie ZANJEER, when this beautiful couple tied the knot and became forever bound to each other by the vows of love. You might think what made them take this impulsive decision? It turns out that Amitabh and Jaya, along with a few other friends had decided that if the movie becomes a success then they would go to London and celebrate. But unfortunately Amitabh’s father, Shree Harivanshrai Bachchan Ji denied him permission based on the grounds that Amitabh and Jaya were not married. Instead of dropping the idea of London trip, Amitabh took it as an opportunity and put forward the proposals for marriage. Jaya agreed and they soon got married and left for London on their honeymoon. It’s been 44 years since that day and they still share that same love, that same care and that same desire for each other. It just portrays the simple truth that when you love a person with true heart, your love for that person just grows, you never fall out of love, you never feel bored. Each day, everyday is a new experience, a new adventure. Like any strong couple Amitabh and Jaya have lived and loved through the test of time and stood by each other and supported each other in the time of need. There was no room for doubts, regarding their partner, in their minds. They are as deeply in love as they were 44 years ago. 44 years of celebrating true love and happiness with the same person is a real relationship goal. And looking at this amazing couple one can just think that with time love just grows and grows but it never grows old.